Improve your golf gaming effectively with the latest Arccos Golf 360 Golf Performance Tracking System. Get to know the golf courses you will visit while knowing your strengths and weaknesses as a player. Arccos Golf 360 features 14 ultralight sensors, allotting one for each club. This feature enables automatic recording and analysis of every shot made. The report also includes live Shot Tracking, GPS 2.0 as well as Tour Analytics to help the player improve on their next shot. Arccos 360 is fully automatic and hands-free, which does not demand tagging or any other interruption. This system also informs the users of the exact distance to any point of the course. Users will even get to know the precise kind of club to use for each situation, along with their strengths and weaknesses in the game. Many count this as a great improvement, since the previous version of the system, unlocks only data viewable by PGA Tour pros. Having a development partnership with Microsoft, more features come with this system. One of which is the indication of the most optimal strategy on any hole detectable. It records and analyses your shots made along with the shots made by others in the Arcos community. The updated low-profile sensors come in size 50% smaller than the original Arccos Golf System. Along with this feature also comes a permanent battery guaranteed to last even up to five years. These sensors also come with a two-year warranty. To supplement the use, iOS and Android users can avail this system’s free mobile app for free. Arccos is known for being the pioneer of Connected Golf, the leading provider of machine-generated insights for the golfing industry. The analysis produced by the software has already helped golfers improve their skills in the game. The hands-free system—which does not require tagging or whatsoever preliminary process—offers convenience to the user. One has to put the sensors and the club and use it immediately. Users never have to worry about any interruptions or such while using the given sensors. This system offers precise data needed for strategic planning on your shots such as distance to any point in the course, best club to use, and strengths and weaknesses. The sensors are very lightweight and immediately offer data to help you strategize for your next move. It also allows you to compare your shots with other users of the same system and learn from those data. The system has a supplementary free mobile app for both Android and iOS users. When used through these operating systems, only a small amount of battery energy is consumed. The non-replaceable batteries make the product useless once its energy has worn off. This means having to buy another set. The app tends to record phantom shots. Phantom shots are shots that “made,” according to the app, though it is not a shot you made. This is very likely to happen when you have a cart path only and carrying several clubs. Arccos Golf 360 is also prone to miss some putts you’ve made, and record putts you did not make. The system will not record the necessary data when you are making a phone call. You will have to choose between answering a call or going on with the round. 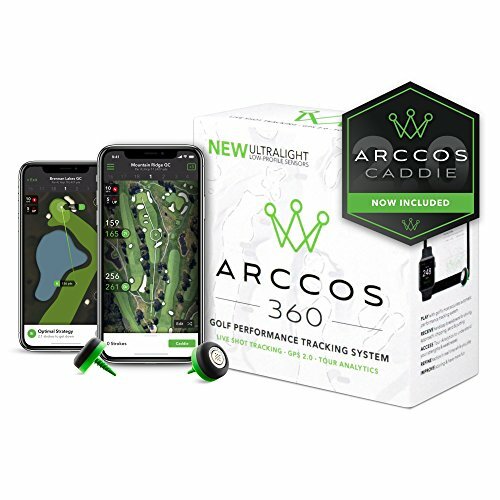 Considering the quality and the service offered by the system and equipment itself, the Arccos Golf 360 is one good find. It has many features that make golf playing easy. It is also a good tool for those who are serious about improving their golf gaming. The app and equipment already provide the details that will be helpful in strategizing. However, counting the years, it is promised to work, and the warranty period, this product gives an excellent value to your money. You can rely on this product for quite a long time before eventually disposing of it. However, one must also be well aware and practical about the lifespan of the system and equipment. Given the fixed batteries in the product, one must be particularly careful in using it. Taking this factor into consideration, one must also consider the time span or frequency he or she intends to use it. Also, one must be fully aware of the other disadvantages and frequent malfunctions that the product has. The features of the product make it an excellent find for every golf enthusiast—whether a veteran or a beginner. Extensive inputs and details provided are useful in strategizing your next shots, even for golfing newbies. This system and equipment can also serve as an excellent substitute to an actual tutor in playing golf. With the given lifespan of the system, this product is best used by frequenters in the golf course. Keeping this equipment and using the system rarely kind of wastes away its quality and utility. Maximizing the use of this equipment and system makes the expenses worth it. With the comprehensive and useful features that this product has, golf course frequenters need to give this system a try. If actual coaches are not available or could not be afforded, then this product can serve as those for users. Also, keeping in mind the durability of the equipment and system, this one is an excellent find. Compared with the other golf helping system and equipment available in the market, Arccos Golf 360 provides the most appropriate and useful set-up. It does not require too many preliminary processes and does not cause too much nuisance regarding its set-up and usage. Despite the malfunctions and inconvenience reportedly caused by it, there is some way to manage and minimize those. However, one must still be prepared with a remedy in case it malfunctions or such. Treatments for such instances can be provided through user reviews online. Overall, this product could offer all the help needed by the golfers, even if it has some problems. The purposes and features serve the function of the system and equipment very well.